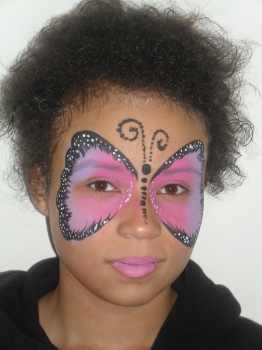 The coolest butterfly face painting ideas are here for you to look at also get some free face painting ideas. I'm sure I don't have to tell you how much FUN kids have with these kind of toddler activities. 1. 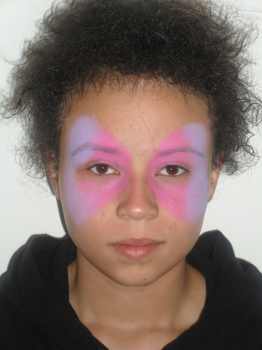 To start begin by painting the face in pink and purple as in the picture. Apply the paint with a sponge and apply inthe shape of wings. Then blend in the two colors so they merge together. Then paint the lips in a bright pink. 2. Next use the white paint to add for around the edges of the wings. Then add spots along the bridge of the nose. start the black spots at the bottom of the nose and work up. Make the spots larger the higher you go. Next paint one large spot between the eyebrows in black. Then the two antenna with a swirl leading from the big spot. These are make with lots of black dots close together. 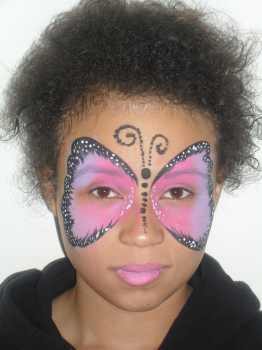 You can print of a butterfly face painting template here as a pdf. It saves having to print the whole of this webpage. If your looking for more face painting ideas then this video below shows you how to face paint a butterfly.